Note: The master branch follows the latest currently released version of Swift. If you need an earlier version for an older version of Swift, you can specify its version in your Podfile or use the code on the branch for that version. Older branches are unsupported. Check versions for details. If you find the project useful, please support authors to keep it alive. You want to help, great! Go ahead and fork our repo, make your changes and send us a pull request. Check out CONTRIBUTING.md for more information on how to help with CryptoSwift. It is recommended to enable Whole-Module Optimization to gain better performance. Non-optimized build results in significantly worse performance. pod 'CryptoSwift', :git => "https://github.com/krzyzanowskim/CryptoSwift", :branch => "master"
Bear in mind that CocoaPods will build CryptoSwift without Whole-Module Optimization that may impact performance. You can change it manually after installation, or use cocoapods-wholemodule plugin. 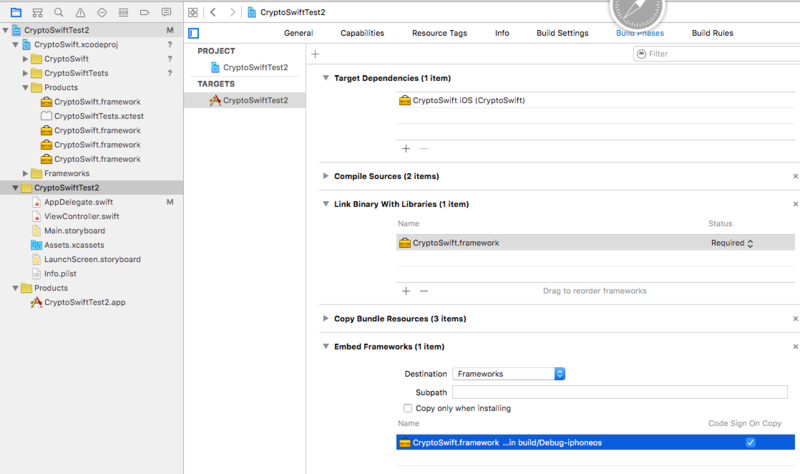 Run carthage to build the framework and drag the built CryptoSwift.framework into your Xcode project. Follow build instructions. Common issues. CryptoSwift uses array of bytes aka Array<UInt8> as a base type for all operations. Every data may be converted to a stream of bytes. You will find convenience functions that accept String or Data, and it will be internally converted to the array of bytes. let hex   = bytes.toHexString()            // "010203"
Some content-encryption algorithms assume the input length is a multiple of k octets, where k is greater than one. For such algorithms, the input shall be padded. Incremental operations use instance of Cryptor and encrypt/decrypt one part at a time, this way you can save on memory for large files. See Playground for sample code that work with stream. The result of Galois/Counter Mode (GCM) encryption is ciphertext and authentication tag, that is later used to decryption. // In combined mode, the authentication tag is directly appended to the encrypted message. This is usually what you want. // In combined mode, the authentication tag is appended to the encrypted message. This is usually what you want. Note: GCM instance is not intended to be reused. So you can't use the same GCM instance from encoding to also perform decoding. The result of Counter with Cipher Block Chaining-Message Authentication Code encryption is ciphertext and authentication tag, that is later used to decryption. // The authentication tag is appended to the encrypted message. Check documentation or CCM specification for valid parameters for CCM. You can follow me on Twitter at @krzyzanowskim for project updates and releases. This distribution includes cryptographic software. The country in which you currently reside may have restrictions on the import, possession, use, and/or re-export to another country, of encryption software. BEFORE using any encryption software, please check your country's laws, regulations and policies concerning the import, possession, or use, and re-export of encryption software, to see if this is permitted. See http://www.wassenaar.org/ for more information. Copyright (C) 2014-2017 Marcin Krzyżanowski [email protected] This software is provided 'as-is', without any express or implied warranty. In no event will the authors be held liable for any damages arising from the use of this software. The origin of this software must not be misrepresented; you must not claim that you wrote the original software. If you use this software in a product, an acknowledgment in the product documentation is required. This notice may not be removed or altered from any source or binary distribution.